Stade de la Mosson is the home ground of Ligue 1 side of Montpellier HSC. Originally conceived as a 16,000 seater stadium, it was entirely rebuilt for the 6 games it hosted in the 1998 World cup hosted in France. In addition to hosting matches from this global sporting event, de la Mosson also hosted group matches in the 2007 Rugby World Cup. 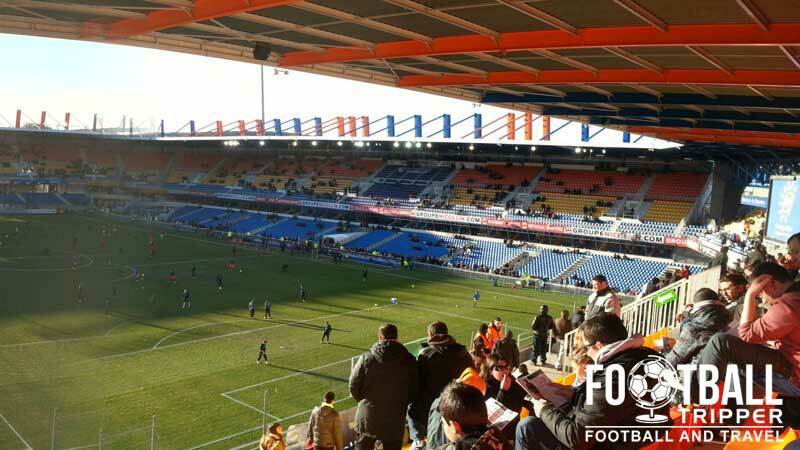 Montpellier have played at Stade de la Mosson since 1972 way back when it had a minuscule capacity of 300. It wasn’t until the first expansion occurred in 1977 that Montpellier had something which resembled a normal stadium. The newly expanded 18,000 seater was overseen by the Mayor of the city and MHSC owner Louis Nicollin who sanctioned the famous stand nicknamed “the Butte” which built into a surrounding mound of earth. 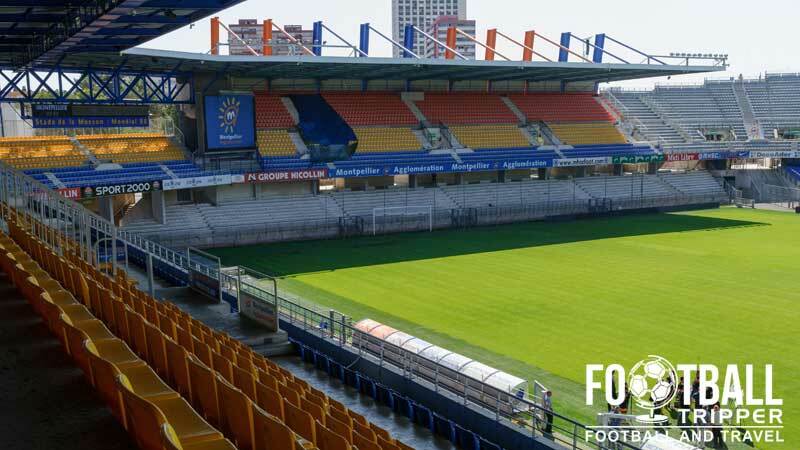 Building on from the first round of work and a positive period of form which saw a quarter final appearance in the Coupe de France along with a push for promotion, Montpellier HSC decided to take de la Mosson to the next level by hiring local firm A+ Architecture to design a new façade for the old stadium. The result was a 23,500 capacity stadium with a further 7,500 spaces for standing spectators. The French bid for the 1998 World Cup greatly benefited Montpellier HSC and Stade de la Mosson as the venue was chosen to to host five group matches and one round of 16. Fifa rules state that all stadiums should have a minimum of 30,000 capacity to host World Cup matches and so de le Mosson received substantial investment of over 130 million francs, bringing the capacity to an impressive 35,000 with the current three tiered stand structure. 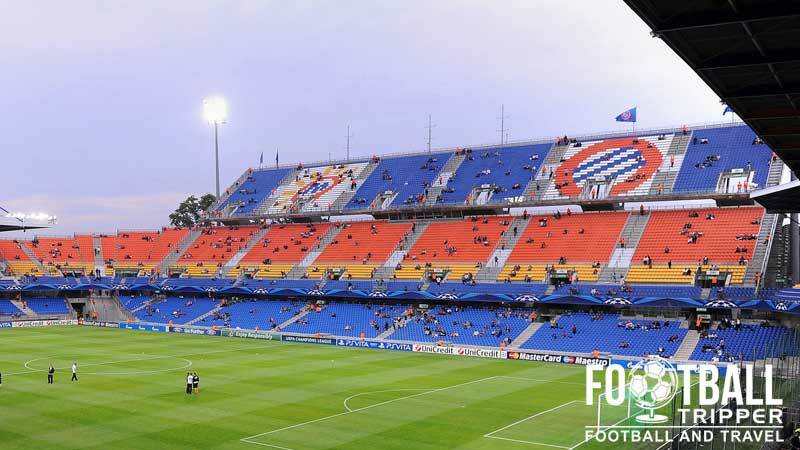 Post Millennium the ground received a few minor upgrades such as when Montpellier qualified for the Europa League in 2010 at the bequest of UEFA stadium regulations, but missed out on further extensive renovation for the French Euro 2016 bid. Still, president of the town Jean-Pierre Moure has pledged the construction of a new transparent roof and improved parking facilities by 2015. De La Mosson is comprised of four stands: Nord, Est, Sud and Ouest. Away fans who make the trip to Mosson Stadium are housed within a small section of seating N – Canigou next to the westernmost goal-end sometimes referred to as the Montpellier Kop. As Stade de la Mosson is situated very much out of town there isn’t a wealth of places to eat and drink, although there are a few boozers a few minutes walk from the Mosson tram stop. Heading back towards Montpellier City centre there is naturally more choice as per the map. The food options inside Montpellier’s stadium are in line with what one would expect to find on sale across grounds in France. Often football fans grab a quick snack and then eat after the game as restaurants culturally open much later in mainland Europe. Montpellier run two shops throughout the city as well as an official online store. The most popular club shop is the one located at Stade de la Mosson, however it appears as if it is only currently open on matchdays. 90 minutes before kick off, half-time and 1 hour after the game. Orange and Blue is certainly a unique colour scheme. The second Montpellier shop is located opposite the Mare Nostrum Aquarium at Square Venice Alley Ulysses, 34000. Stade de la Mosson was built in 1972 and although it was refurbished as recently as the 1998 World Cup, La Paillade do not currently offer fans the chance to go on a tour of the stadium. Tickets to see Montpellier Hérault Sport Club can be purchased online, at the stadium (Ticket booths and club shop), at the Odysseum Shopping Centre (East Montpellier) or from one of the numerous ticket vendors in the country such as Francebillet and Ticketnet. The club shops generally offer fans the chance to purchase tickets up to 2 weeks before the date of the match, with the ticket windows opening approximately 2 hours before kickoff for most games. 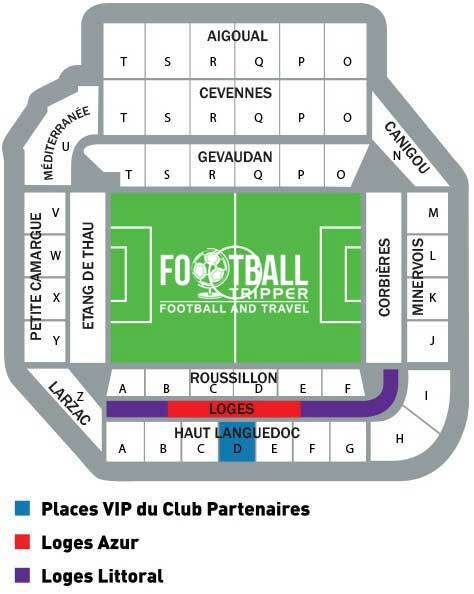 Price wise, tickets for the highest part of Tribune d’Honneur cost €25.00, with a seat in the corner of the stadium priced similarly. 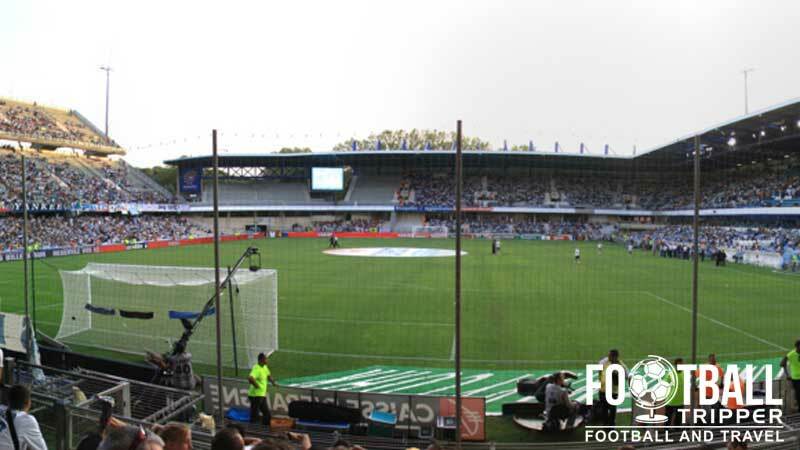 For something central, expect to pay a maximum of €65.00, although you can likely pick something up much cheaper than this and still get a decent view of the action on the pitch. Stade de la Mosson is located way out in the sticks of Montpellier, at over 6km away from the historic city centre, beyond the barrier of the D65 road which surrounds the outer city limits. If you are arriving by car you can easily access La Mosson Stadium by the A9 motorway with the Montpellier Ouest (West) exit taking you in the direction of Mosson and Silver Cross. For parking, the the local council has set up enough spaces for 2,450 cars on game days with the car park being just 5 minutes walk from the Stade. The main passenger station of the city is called Montpellier Saint-Roch, and the town holds the distinction of being one of the places in France to have a railroad back in 1839. Today the station has high speed links to the rest of the country courtesy of TGV who run services to cities such as Paris and Lyon. The tram is arguably the easiest way to get to the stadium with Stade de La Mosson being the last stop on Line 1 which makes it very hard to miss. You can catch the tram line 1 towards Mosson from either the main rail station (Montpellier Saint-Roch) or from any of the other stops on route such as in the Northern part of the historic town. The journey takes around 30 minutes and just to clarify the stop or station to get off at is called “Mosson”, with a more frequent service running on matchdays. The closest tram stop to the stadium is appropriately named and easy to remember. Greater Montpellier Transport Network (TAM) run bus services to the stadium with lines 15, 25 and 34 all taking fans to the stadium, with departures and arrivals mimicking the route of the tram lines. Montpellier Méditerranée Airport is 15 km Southeast of Stade de la Mosson and about 10 km from the city centre. As an international airport you can easily travel to Montpellier from a number of International destinations, making the city one of the most accessible and most suitable places in the South of France for a weekend jaunt. Once you have landed at the coastal airport you can catch a shuttle bus service which costs € 1.50 and will take you 15 minutes or you can simply rent a car and drive up the Montpellier-Est motorway. There are a few hotels close to Stade de la Mosson but none of them appear to have many reviews. Prop’Hotel is the closest, with Hotel Abelia coming in second place. Heading back to the city centre via the tram, you will be met much much more choice of where you stay, with Ibis Montpellier Centre and Hotel Les Fauvettes being two safe choices.